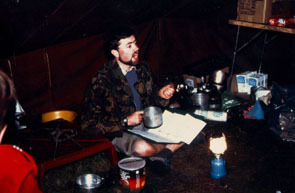 I was a Scout Leader with the 1st Breadsall Village, 158th Derby Scout Troop from September 1984 until February 1997. Here are a few pictures from over that period. 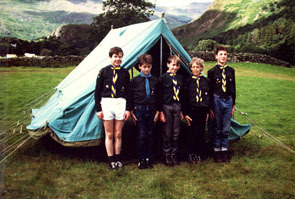 These pictures show a scout trip to Beddgelert in North Wales during August 1986. 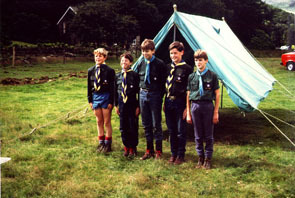 This show an unusually tidy patrol and tent ready for inspection. From the left are Mark Pollard, Mark Benson, Jamie Widop, Johnny Davies and Jimmy Knifton. This is the other patrol on that same trip and consisted of Robert Benson, Roger Godber, Anthony Daykin, Johnathan Jupp and Mathew Lister. 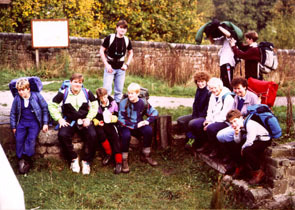 These next two pictures are of a scout Youth Hostel trip in October 1990. We caught the train to Hope on Friday evening and then walked to Castleton. On Sunday we went on to Buxton, followed by Hartinton for Sunday evening and Elton for Monday. 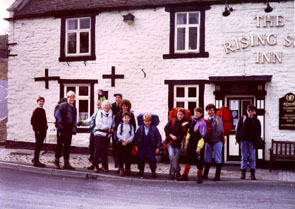 The picture shows us on the way from Elton Y.H. to Whatstandwell railway station on Tuesday morning. Pictured from the left Charlie Binns, Paul Gamblen, Rich Martin, Pat Hallam, Andy Gregory, Katherine Munt, Johnathan Pither, Ian Bowyer, Matt Smith, Ian Goodall, Edna Blount and Paul Furmston. 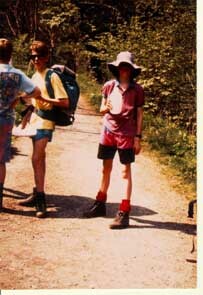 This shows us later on the same day down by the Cromford canal having another small rest.